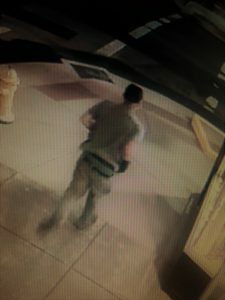 One of the two surveillance camera shots posted by the Albany police. One of the things we’ve learned from the Case of the Downtown Tree Chopper is that downtown is under video surveillance and the cameras never sleep. Video surveillance was a key element, apparently, in solving the April 29 vandalism, which destroyed or damaged, among other things, about a dozen newly planted trees along Lyon Street. The trees had been planted as part of the downtown streetscape upgrade. Police posted two images on Facebook and maybe other social media, asking for help in identifying the man. On Friday morning, police said, Nicholas Randklev, 29, an Albany resident not otherwise identified, walked into the police headquarters and said he was the man in the pictures. He was arrested and cited to appear in Circuit Court on a charge of first-degree criminal mischief. The Downtown Association had posted a $700 reward for information leading to a conviction. If the suspect is indeed convicted, chances are he’s not in line for the money even though he clearly was the one providing the information that clinched the case. “… and all that…” Really Hasso? Government surveillance cameras are creepy. Please dust off your copy of 1984 and read it again. The problem with cameras isn’t privacy. The cameras are in public places and record what any person or police officer can lawfully observe. Watching what happens publicly in plain sight doesn’t invade anyone’s privacy. The bigger issue is the power of city government. Cameras are a tool that can be used for good and bad. Don’t like the politics of a poster on Hasso’s blog? Harass the person by tracking them with a city camera. If cameras are implemented with aggressive control mechanisms, these might mitigate the fear of abuse by elected city officials and un-elected city bureaucrats. Big Brotherism isn’t inevitable, but it’s not implausible either. Self-driving cars will become a regular thing in Albany within 5 to 10 years. They’ll be all over town, with cameras pointing in all directions. And you can bet the companies running them will provide images to the police when they request it. Surveillance is nothing today company to what it’s gonna be in ten years. Take a deep breath folks… These cameras are PRIVATE. I have 20 cameras at my store, a bunch at another business across the street one of which is a license plate camera, drive past and your license plate is captured. My neighbors cameras were instrumental in capturing the guy who stole the sawmill next door. Rich is right. Funny how people get all upset at “govt camera’ but are unaware and don’t care about “private cameras”. It’s a cognitive disconnect. Private cameras can sell your image to anyone they want; be hacked pretty easy and videos stolen; and placed anywhere the owner chooses. Next time you go to the dressing room to try on clothes, smile. You’re probably on camera as you enter and leave, at a minimum. Most business owners are cognizant of privacy needs, but you have no guarantee. Bob, the rules for private cameras are the same for public as far as dressing rooms are concerned. Verboten. Most private systems are not hackable. Most are not hooked up to the internet. My cameras are pointed at public places, public places on my private property, and private places where there is no expectation of privacy (not inside restrooms). They are there to deter theft or otherwise untoward behavior. The fact that they are in plain sight is the most deterrent. In short, they work. Cameras are private and a sign of the times. Hopefully the suspect is convicted, ordered to pay 100% restitution and how about 500 hours community service keeping the sidewalks downtown clean. Guess I shouldn’t be surprised at the conclusion jump that the gummint had spy cameras around Albany. Get a grip folks. Granted that even paranoids have enemies, but the gummint (mayor, council, governor, congress, etc) can’t pull the stunts claimed. The camera eye is watching us all so we had better smile. Smile while walking. Smile while driving. Smile and for goodness sakes ….pull up our pants! See photo. Ha! It should say Criminals beware. Nice folks, as H.J. said, just smile !